So, how do you say ‘Thank you’ in Russian? You can learn easily! Below, RussianPod101 brings you perfect translations and pronunciation as you learn the most common ways Russian speakers say ‘Thanks’ in various situations. Eta ochen’ mila s Vashey starany. Спасибо за то, что пришли сегодня. Spasiba za to, shto prishli sevodnya. This welcoming phrase should be part of your arsenal if you’re conducting more formal meetings with Russian speakers. If you’re hosting a party, this is also a good phrase when you greet your Russian guests! This means the same as ‘Thank you’, but with energy and enthusiasm added! It means almost the same as ‘thank you so much’ in Russian. Use this in an informal setting with your Russian friends or teachers. Такого учителя, как Вы, непросто найти. Takova uchitelya, kak Vy, neprosta nayti. Some phrases are compliments, which express gratitude by inference. This is one of them. 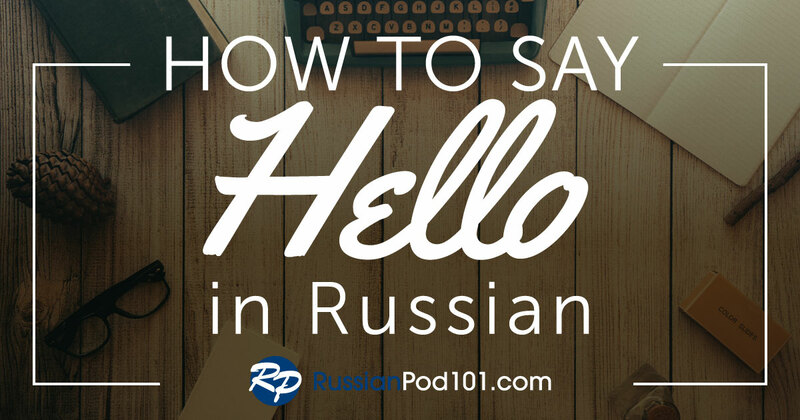 If you’re particularly impressed with your RussianPod101 teacher, this is an excellent phrase to memorize! Spasiba, shto udelili nam vremya. Any host at a gathering with Russian speakers, such as a meeting or a party, should have this under his/her belt! Use it when you’re saying goodbye or busy closing a meeting. It could also be another lovely way to thank your Russian language teacher for her time. Благодарю Вас за терпение и за то, что помогаете мне становиться лучше. Blagadaryu Vas za terpeniye i za to, shto pamagayete mne stanavitsa luchshe. This phrase is another sure way to melt any formal or informal Russian teacher’s heart! Teaching is not easy, and often a lot of patience is required from the teacher. Thank him/her for it! It’s also a good phrase to use if you work in Russia, and want to thank your trainer or employer. 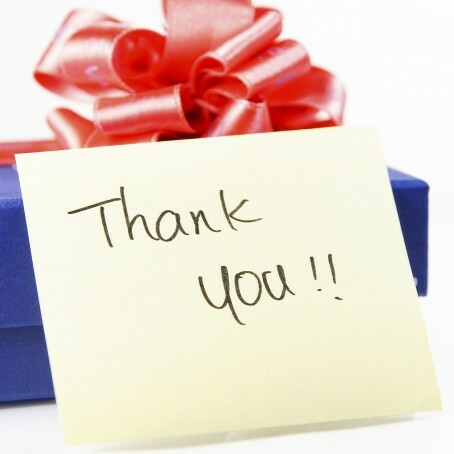 You will go a long way towards making yourself a popular employee - gratitude is the most attractive trait in any person! Я так много узнал благодаря Вам. Ya tak mnoga uznal blagadarya Vam. Wherever your destination maybe, manners are a must! And in this respect, Russia is no different. In Russian “Thank you” is spasiba. Now in Russian there are other ways to express one’s gratitude. There are more formal and more casual ways to do this. You can emphasize spasiba by adding bol’shoy which means “big”. Bol’shoy spasibo literally means “Big thank you” and is the equivalent of “Thank you very much” in English. For very special occasions when someone goes above and beyond the call of being kind, when someone is extremely generous, or for any other time you’re extremely grateful, we have the following phrase to express extreme gratitude: Blagadaryu vas. The first word blagadaryu means “(I am) thankful.” It is followed by the polite “you” which in Russian is vy but in this sentence we use vas. So in English it would be something like “I am grateful (thankful) to you”. To reproduce the Russian consonant “r” in blagadaryu you should roll your “r”’s. The Russian “r” resembles the Italian or Spanish ones, but even if you don’t roll it properly you will be easily understood anyway. Please do know that in Russian there are two ways of referring to people: formal and informal. So let’s start first with the polite form. The polite equivalent of the English “you” is vy in Russian. This polite word contains a sound that does not exist in English and is transcribed by the letter “y” but please don’t worry; I will teach you how to produce this sound. Open your mouth as if you were preparing to pronounce the sound “a” in the word “able” and holding the same open position of your mouth try to reproduce the sound “ee” like in the word “if”. Doing it this way you will achieve the desired sound “y” which is present in vy. Please note the same letter “y” will be also used to show the short “ee” sound and after some consonants in order to soften them. We use vy when we want to show respect to the other person or when the context requires formality. For instance, when meeting someone for the first time, at a shop, at work, with a professor, or with an older person. However, vy is not always required when you meet someone for the first time if the setting is casual, say at a party with people of your own age. Younger people, especially, are using vy less and less.They often speak directly inty with each other and even their grandparents. So ty is the informal equivalent of “you”.The sound “y” here is the same as vy. We use ty in contexts where we know the person personally and the environment is casual. People of one’s own age, classmates, family, and friends are such people. At home, at school, friendly social settings are such contexts. Ty is the most common form of “you” that you will hear, so don’t feel nervous about using it. Not many Russians know that the origin of the word spasiba came from two words, spasi which means “save” and Bog which means “God”. So the meaning of it is “May God keep you safe!” which was an old way of expressing gratitude. So surprise your Russian friends by asking them the origin of the word spasiba! On the run to Russia? Wait! You can’t go without some basic language phrases under your belt! Especially if you’re heading to meet your prospective employer! Either in person or online, knowing how to say ‘Thank you’ in the Russian language will only improve their impression of you! RussianPod101 saves you time with this short lesson that nevertheless packs a punch. 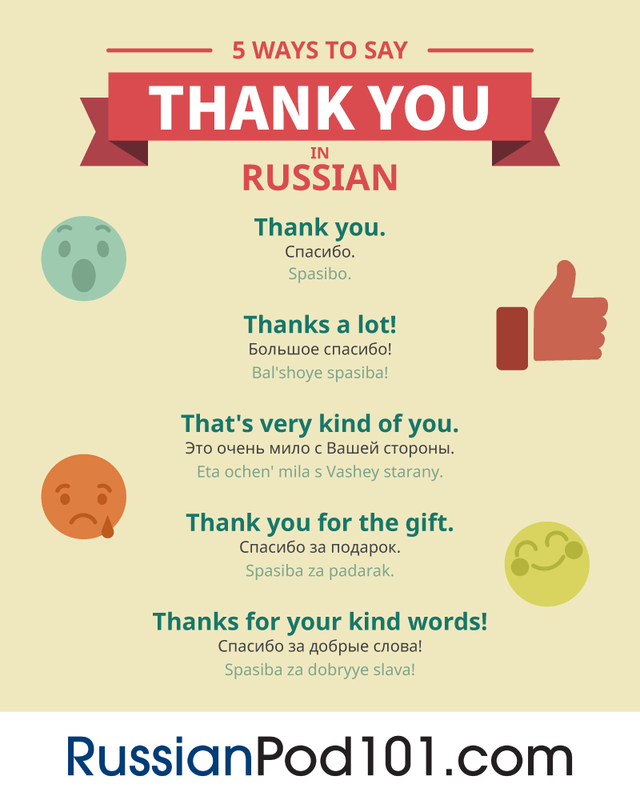 Learn to say ‘Thank you’ in Russian in no time! Perhaps you think it’s unimportant that you don’t know what ‘Thank you’ is in Russian, or that it’s too difficult a language to learn. Yet, as a traveler or visitor, you will be surprised at how far you can go using a little bit of Russian in Russia! 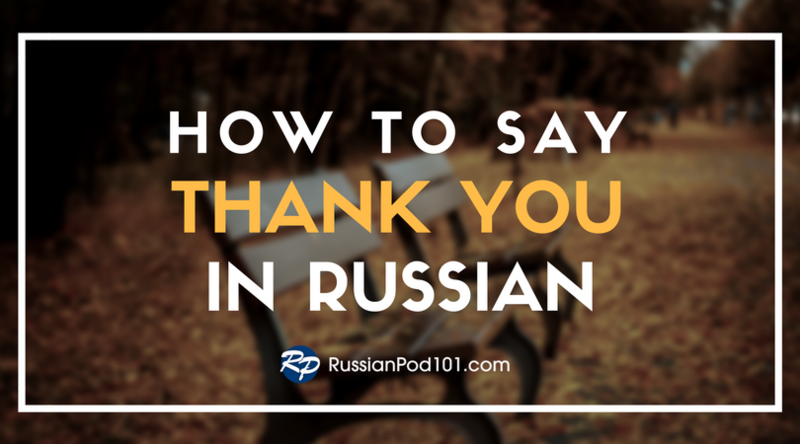 At RussianPod101, we offer you a few ways of saying ‘Thank you’ in Russian that you have no excuse not knowing, as they’re so simple and easy to learn. The lesson is geared to aid your ‘survival’ in formal and informal situations in Russia, so don’t wait! You will never have to google ‘How do you say thanks in Russian’ again…! 5. Why would RussianPod101 be the perfect choice to learn Russian? However, you need not stop at ‘Thank you’ in Russian - why not learn to speak the language?! You have absolutely nothing to lose. Research has shown that learning a new language increases intelligence and combats brain-aging. Also, the ability to communicate with native speakers in their own language is an instant way to make friends and win respect! Or imagine you know how to write ‘Thank you’ to that special Russian friend after a date…he/she will be so impressed! With more than a decade of experience behind us, we have taught thousands of satisfied users to speak foreign languages. How do we do this? First, we take the pain out of learning! At RussianPod101, students are assisted as they master vocabulary, pronunciation, and conversation through state-of-the-art and fun online learning methods. A library replete with learning resources allows for you to learn at your own pace and in your own space! Resources include thousands of video and audio recordings, downloadable PDF lessons and plenty of learning apps for your mobile devices. Each month, we add benefits with FREE bonuses and gifts to improve your experience. We accommodate all levels and types of learners, from Absolute Beginner to Advanced, and RussianPod101 is free for anyone to sign up. However, you can choose to fast track your fluency with lesson customization and increased interactive learning and practicing. Upgrade to Premium, or Premium PLUS to enhance your experience and greatly expedite your learning. With this type of assistance, and pleasurable effort on your part, you will speak Russian in a very short period of time! 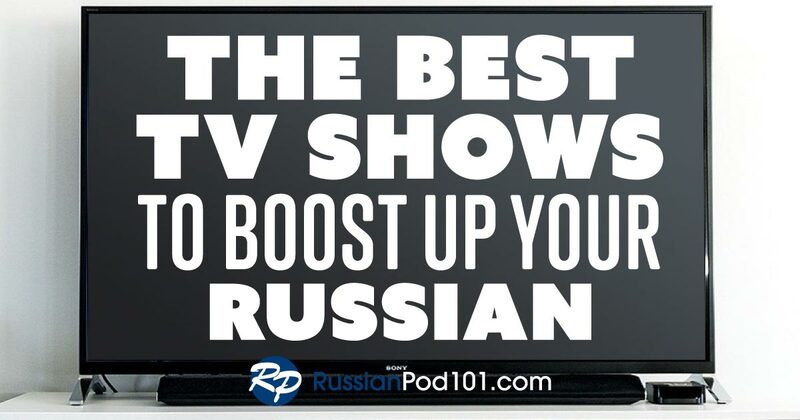 Click Here to Visit RussianPod101! Best of all is that you’re never alone! We believe that practice is the holy grail of learning any new language, and we gear our courses to ensure lots of it. Enroll with us, and you gain immediate access to our lively forum where we meet and greet, and discuss your burning questions. Our certified teachers are friendly and helpful, and you are very likely to practice your first ‘Thanks!’ in Russian on him/her, AND mean it! Hurry up, and sign up now - you will thank us for it.